Terminal City Brewing is Vancouver’s first Brew-On Premise(s) establishment. We first opened our doors as West Coast U Brew on May 10, 1993, and have since provided the best products and services available in the on-premise brewing market, from their unique in-house beer recipes to some of Canada’s premium wines. 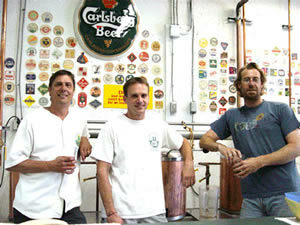 Dave Harrop, chief cook and bottle washer took over West Coast Brewing from his close friend and associate Roger in 1995. Roger moved up to Campbell River where he and his partners started up North Island Brewing. Jason and his crew are making some great beers up there now. Trevor, Ben,Dave Jr., and Jon make up the team. While Trevor runs the place as the Manager, Ben will be usually found in the wine room and Jon usually brews on Sunday. Dave Jr, is our newest employee and he is learning the ropes. Collectively, the team brings together more than 50 years of experience. We believe, by far, that our brews can compete with any beer on the market and beat them. We make beers from easy slurping baseball beer to heavy dark stouts. Specializing in Hoppy IPA’S we have special fresh hops that we use in transfusions to make wickedly hoppy beers. If you love your hops then you found the right place to brew your beer. We have a 300,000 BTU steam boiler that cranks out enough steam to heat our mash tun and 5bbl brew kettle. The beautiful thing about steam is its efficiency. 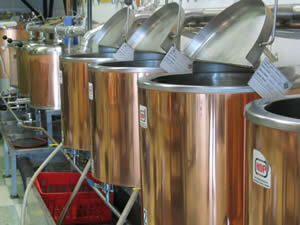 Indirect heating in the steam kettles prevent burning and over cooking. Our temperature controlled rooms are at the optimum temp for fermentation and conditioning. We also have 2 free bottle sanitizers that will help you move through the system quickly. Our stainless beer bottling table has 4 stations with plenty of room for your helpers to cap and put away your beers. New additions to the Brewery are the semi automatic canning line and our fully automated glass filler.Over all our near 5000 sq ft of space has plenty of free parking in the back and a great loading bay in the front for (un)loading all your bottles. All Grain Brewing Now Available! We are all set and brewing our full mash brews now. Our specialty, of course, are our staple North American IPA styles. We have a really nice Nut Brown Ale, and a perfectly balanced Pale Ale recipe. We have also built a small room suitable for lagering our beers all year through!! Now available, the only Brew on Premises “IN VANCOUVER” to offer all grain ales and lagers. Prices are not much more than our regular beers, about $10-15. Some of these beers take longer to ferment with the use of Lager yeasts. (About 1 month in total). We are all-grain all the time now with an expanded selection.